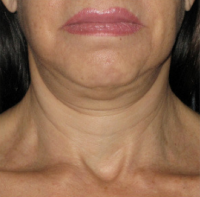 ﻿ Say Goodbye to that Double Chin and Fight Sagging, Loose Skin with Non-invasive Ultherapy!!! Say Goodbye to that Double Chin and Fight Sagging, Loose Skin with Non-invasive Ultherapy!!! Skin concerns change with age. In our youthful teens, when the only thing we have on our minds is fighting acne, we don’t give a second thought about the firmness of our skin. It’s taken for granted until the hands of time age our skin, resulting in once-supple skin becoming loose and sagging. During the intrinsic aging process, skin loses much of the collagen necessary for plump and youthful skin. Additionally, the poor health choices that have been made over the years, such as excessive tanning without sun protection and smoking, become noticeable through wrinkling. All the above eventually cause our skin to start drooping under the neck giving us a double chin or “turkey neck”, droopy eyebrows and eyelids making us look tired, and sagging skin around the cheek and jawline making us lose our once youthful appearance. A drooping dermis may be an inevitable part of aging, but it doesn’t have to be a permanent fixture of one’s appearance. Anand Medical Spa is now offering a revolutionary treatment for loose, sagging skin through Ulthera, a non-invasive and FDA-approved procedure that tightens and lifts the skin around the neck, chin, and eyebrow. The Ulthera machine works by stimulating the structural support layers of the skin with ultrasound. The results are an immediate small boost in skin firmness, followed by a gradual growth of new collagen over time within the skin. Unlike a invasive surgical face-lift, there is NO downtime with Ulthera as you can go back to work and/or your regular activities the same day. Don’t be embarrassed by your double chin or sagging facial skin anymore and let Ulthera give you the uplift you need this summer!! !